Flexible, last file or folder – opens last file or last folder, what it was later. Do not recall network/removable media – forbids the automatic display of files/folders from network volumes and removable media. 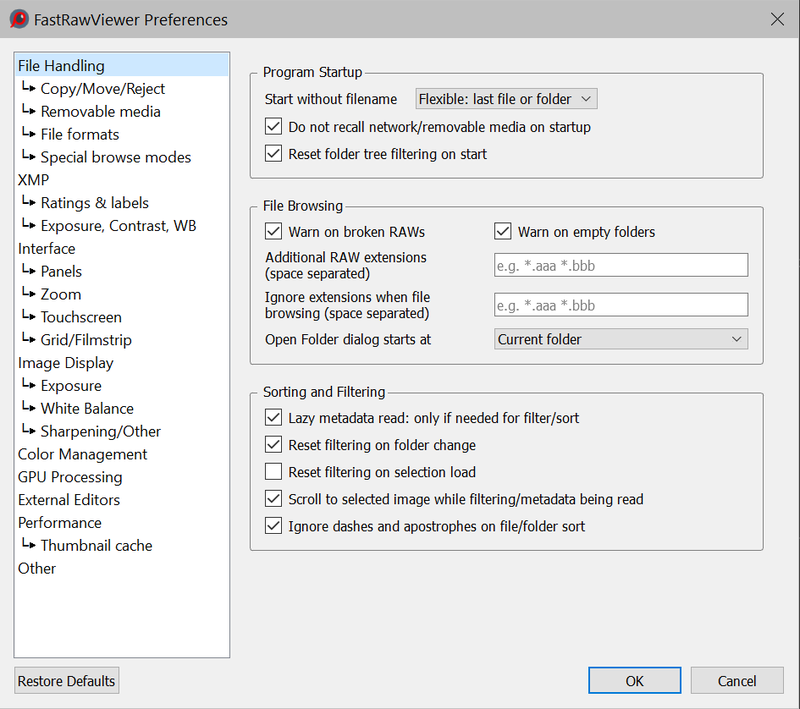 Reset folder tree filtering on start – will clear folder filtering on program start. Warn on broken RAWs – turns on the warning if a damaged RAW file is encountered. Warn on empty Folders – turns on notifications for situations when folders have no files the program can process. 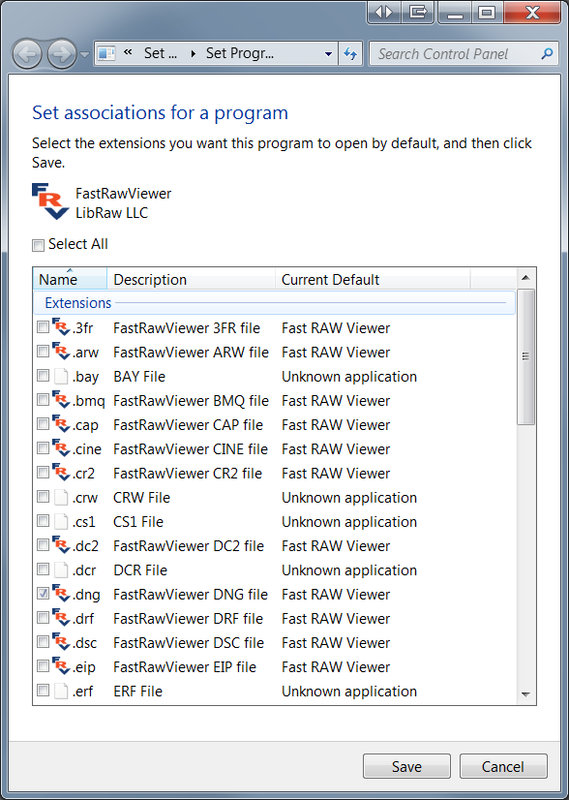 Additional RAW extensions – additional extensions for the RAW files FastRawViewer should process (appended to the built-in extension list). - will not be displayed in the "Open file" dialogue window. Current folder – Current folder. One level up – One level up. Specified folder – the folder specified by the user, always the same (until a different folder is specified here). This group controls behavior for the sorting and filtering of files in the current folder. Lazy metadata read – if, for the current sorting/filtering method, file metadata (EXIF or XMP) isn’t necessary, then metadata won’t be read (ahead). Reset filtering on folder change – if this setting is turned on, then filtration will be turned off when changing the current folder. Reset filtering on selection load – will reset file filtering when Menu – Select Load/Append selection from file is used. Without this option only not filtered files will marked based on file list loaded, while filtered out will remain invisible and so unmarked. Scroll to selected image while filtering/metadata being read – if metadata is necessary for filtration/sorting, then the files in the current folder will be re-sorted/re-filtered as metadata reading progresses. When this setting is turned on, Grid/Filmstrip will auto-scroll to the currently selected file (meaning scroll the Grid/Filmstrip at the same time as re-sorting/filtering – it will automatically return to the current file). Ignore dashes and apostrophes on file/folder sort – sorts files without accounting for punctuation marks in filenames. Use global rejected folder – sets the folder for Rejected files as a global folder, or as a subfolder in the current folder (checkbox is unchecked). Subfolder for rejected files – the name of the subfolder to store the rejected files. No – never warn me. Always – always warn me. Multiple files – warn only moving several files to the _Rejected subfolder. Confirm file move – customizes the warning about moving a file(s) to the same destination as for the previous operation, with same options as for the setting directly above this. Show progress bar on copy/move/reject – controls the display of the progress bar for these operations (the progress bar also allows to stop the operation, if necessary). Select copy or move – at each drop action, the user will be prompted to select what to do with the file (copy, move, cancel the action). Move files – the files will be moved, while the request for confirmation is controlled by the Confirm file move checkbox in the same Copy/Move/Reject pane). Enable move to _Selected subolder – turns on support for the _Selected subfolder, you can set a custom name for it in the neighboring field. Verify file contents after copy – turns on the verification of files after copying or moving a file to another file system. Remember drop targets in last used copy/move lists – turns on the recording of the names of folders that are used in drag and drop to the list of folders in copy file to/move file to. Change/Cleanup recent folders/file lists and favorites on folder tree edits – when renaming folders, whether to rename/remove elements in the Recent files/Recent folders/Favorite folders lists, etc. Allow move/reject for locked files (Mac only) – allows for the moving/copying of locked files. Last used – the folder that was used last for Copy or Move operation (for Copy and Move, separate “last used” lists are kept). One level up from last used – a folder one level above (“parent”) the previous option. One level up from current folder – a folder one level above (“parent”) the previous option. Specified folder – the specified folder (an additional text line input will pop up to enter the folder path with folder selection button). Additional file extensions to copy/move with file. Allows one to list the additional file extensions of the files to be copied/moved along with the main (raw) file of the given extension. Syntax: RAWext+AUXext, several such pairs can be listed, separated by spaces. If AUXExt starts with a dot, then the extension will be added to the end of the FILENAME.RAWext (FILENAME.RAWext.AUXExt); if it starts with a letter, then RAWext will be replaced by AUXext, forming FILENAME.AUXExt. An asterisk (*) can be indicated in place of RAWext, in this case, this will be applied to all files. Attention: the rules that govern copying JPG, XMP, .rpps are defined separately via the Handle RAW+JPEG together, Use XMP for RAW files, Write RPPS files settings, accordingly. Clear undo history on folder change – clears the undo history when the undo is changed. Undo history length – sets the number of undo levels. This group of settings sets the specifics of work with removable media and network volumes. Open most recent subfolder in – opens the most recent (by date of modification) subfolder in the selected folder (/DCIM by default). 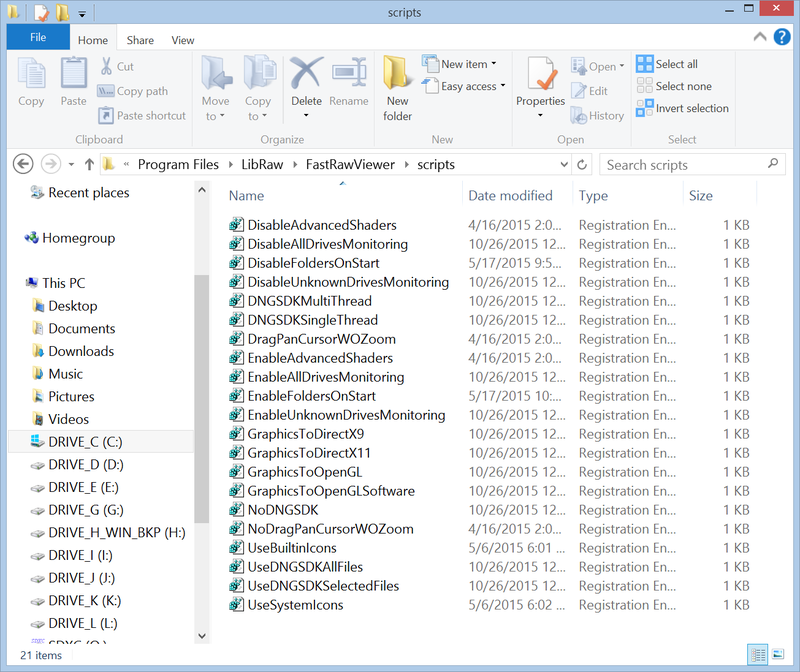 Open folder – opens the selected folder. Do nothing – Do Nothing. Warn before automatically open folder on removable media – display a warning before automatically opening a folder on removable media. Disable A: and B: floppy access – prevents any access to the A: and B: drives, as well as monitoring of changing media for those drives (Windows only). This preference is intended for the (fairly common in our day) case of a computer having a floppy drive controller, and one or two drives being “visible” to the system, though they’re not actually present. – this setting will switch on the display of the contents of the current un-mounted volume in this panel (if this setting is Off, the network devices that do not have a drive letter assigned will not be displayed). Monitor folder changes on removable media/network volumes – monitor changes in removable media/network volume folders, updating the Folders and Filmstrip panels when new subfolders and files are added. Prefetch depth on removable media/network volumes – sets how many files to decode before moving to the next file. PNG file support, TIFF files support – turns on support for the respective formats. Handle RAW+JPEG together – turns on the pairing of RAW and JPEG of the same name: displaying them as different representations of the same image, and treating them as a single unit for move operations, so that both are relocated to a different folder when a move operation is invoked. Do not show internal JPEG if external JPEG is present – removes the embedded JPEG from the list of available representations if there is an external JPEG (which, usually, has better resolution). – FastRawViewer will rotate the external JPEG if necessary, to match the orientation of the RAW image. On prefetch – the decoding happens in advance, decoded data is cached. Same as previous – the same as for the current file. RAW, internal JPEG, external JPEG – explicit designation of the representation. 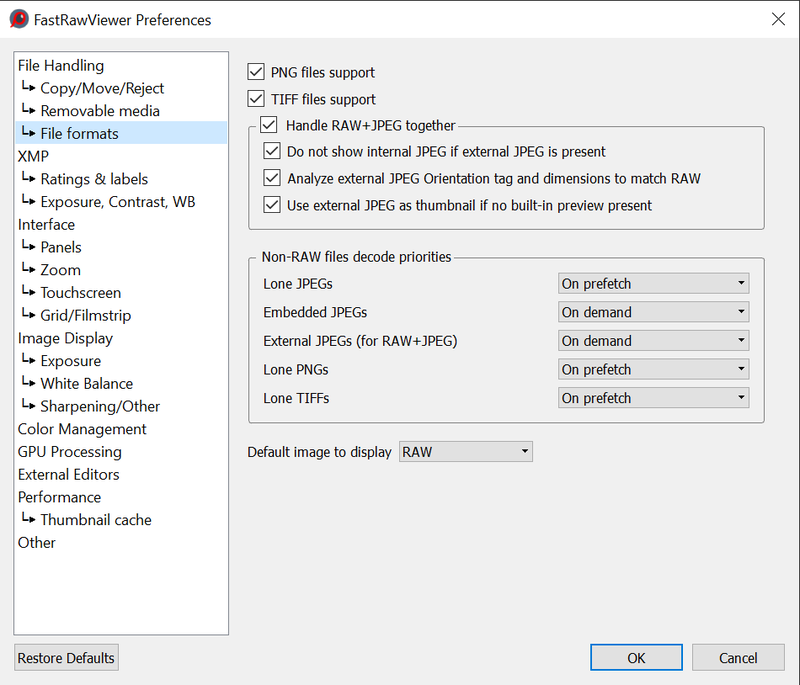 Use XMP for RAW files – turns on/off the use of XMP files. Read Only XMP – turns on the mode, where XMP files are read, but not changed. Warn about XMP writing errors – informs the user of any errors that occurred during the XMP file recording process. Warn if overwrite XMP for file with same name – If it is "on", FastRawViewer will ask user for confirmation before overwriting an XMP sidecar file containing settings for a file with the same name but different extension. Disable batch XMP operations if files with same name are selected – If it is "on" (default) and the selected files contain filenames that differ in extension only, the batch editing of XMP (setting or changing orientation, labels, ratings) will be grayed out / disabled in Menu - Select/Batch and in context menu. Force XMP file creation – turns on the unconditional creation of XMP files, even if no adjustments were changed manually while viewing the RAW file (those adjustments are orientation, white balance, exposure adjustment, labels and ratings). Useful for automatic propagation of adjustments to the next file. Write XMP blocks to JPEG files instead of creating sidecars – when working with JPEG files, record XMP blocks directly to the JPEG files, instead of creating sidecar files. Fallback to XMP sidecar if XMP block write to JPEG fails – if XMP block could not be recorded into JPEG file (e.g. because of read-only file), FastRawViewer will create XMP sidecar file for this JPEG file. Restore original JPEG file date after writing XMP block – if this setting is turned on, then after writing an XMP block, the original file modification data will be restored. RAW+JPEG mode: embed XMP block into JPEG – in RAW+JPEG mode, writes not only XMP sidecars, but also XMP blocks into JPEG files. Use XMP Reject Rating – turns on the possibility of setting the rating to -1. This rating is supported in Adobe Bridge. The setting is turned on automatically when selecting XMP Label Style: Adobe Bridge. Adobe Bridge: Select, Second, Approved, Review, To Do. Color labels/Adobe Lightroom: Red, Yellow, Green, Blue, Purple. Review status/Adobe Lightroom: To Delete, Color Correction Needed, Good to Use, Retouching Needed, To Print. Custom – user labels (any text you choose). Use custom string for not set labels – allows one to set text for a un-set mark (if the text isn’t set, then when setting a mark in “un-set” the xmp:Label tag is deleted from the XMP file). Write photoshop:Urgency tag with color labels (for PhaseOne C1) – Turns on the recording of the XMP-tag photoshop:Urgency, which is used by CaptureOne to recognize and set color labels. The setting is activated only if the mode XMP labels is set in 'Color Labels' (this is the default). In other modes, the XMP Labels photoshop:Urgency tag is not modified: if it was in the XMP file, it stays unchanged. Visual feedback on rating label change – give easily-seen visual feedback when ratings/labels are changed (as in Adobe Lightroom). Adobe process version for newly created XMP files. Default: Version 3 (2012), can be set to Version 1 (2003)…. Version 5 (2019). If the tag crs:ProcessVersion is set already in XMP file, the version doesn't change and the exposure is written according to the version. For Version 3 – Version 5 process, Exposure2012 (equal to expo correction in FastRawViewer plus Adobe Shift) and the tags Contrast2012, Whites2012, Blacks2012 (set to 0, if these tags are not present in the file) are recorded. Write adobe-compatible Contrast/Blacks into XMP files – enables the recording of the contrast settings in the Adobe-compatible format. FastRawViewer – use tags recorded in FRV (libraw: ), if they exist. 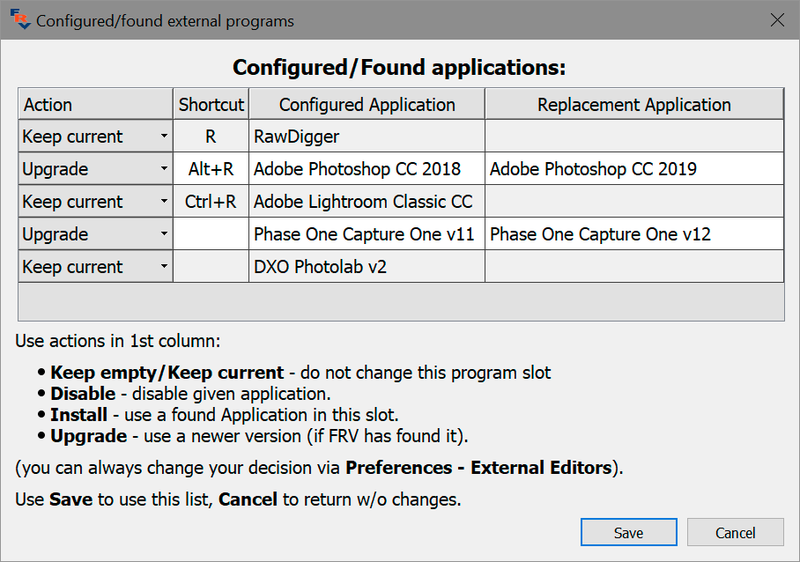 Flexible: last recorded – choose between FRV/Adobe according to the date of the last change made to the file (only works with the FRV tags of version 1.4 or newer). The group of settings for user interface adjustments. Bottom bar font size – controls bottom bar font size (Small – Extra Large on Windows and Normal – Extra Large on OS X). Background Gray level allows you set the brightness of the main program window background. Selected/active files contrast – allows one to change the contrast (against the FRV background) of selected or active files when showing them in Grid mode or in the Filmstrip panel. 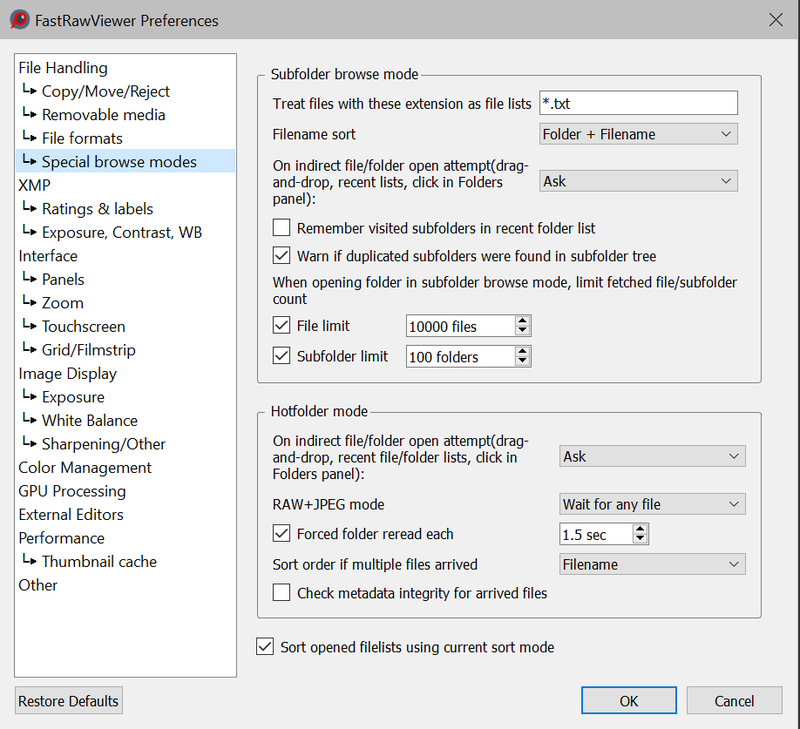 Selected files background – allows one to set the background color for selected files. Active (current) file border – to set the color for the frame around the current file. 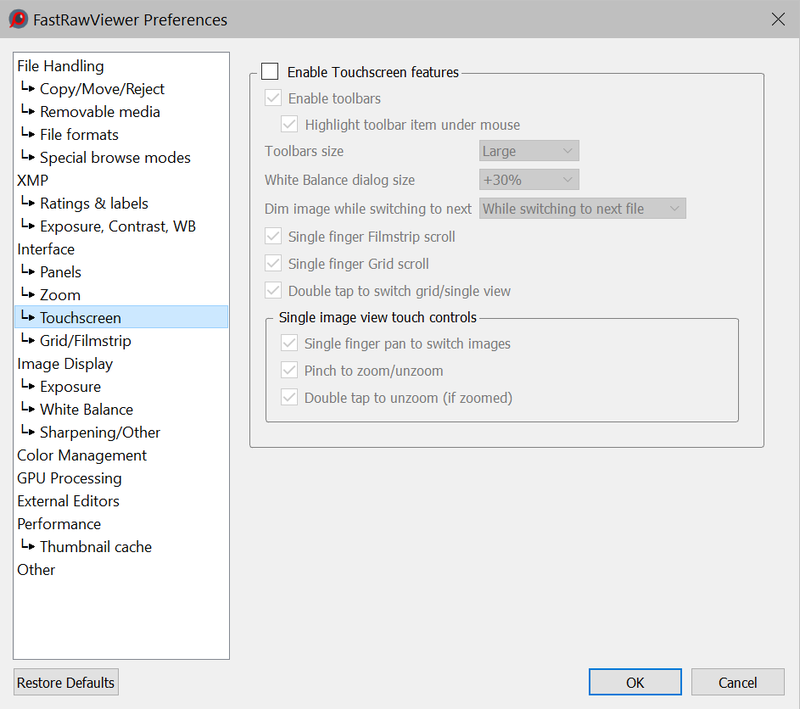 Always – the program brings itself to the foreground for both Fullscreen and “windowed” modes. Ignore successive wheel events for NN msec – this setting is designed to tame the stream of events generated by mouse wheel, Apple Magic Mouse, or trackpad. Set the main menubar colors to match the main window – (Windows only) colors of main menu bar will match main window color scheme (Note: color of program top bar is controlled by Windows and could be edited only via Windows Colors Control Panel/PC Settings page). 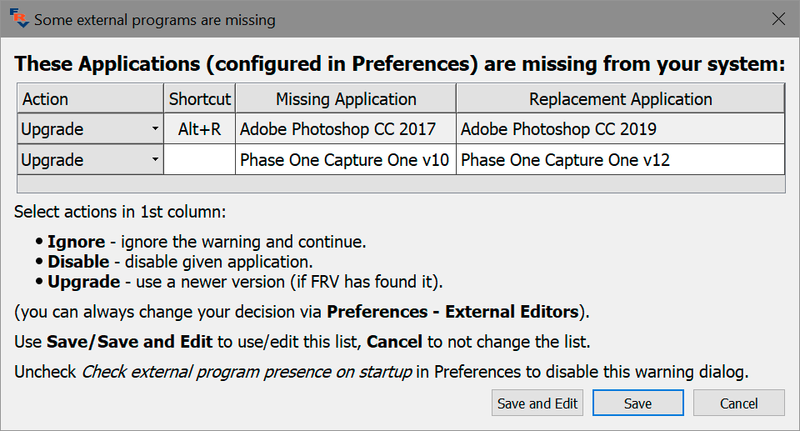 If 'Restore last View settings' is turned on, then during the next start-up of the program, the above-listed parameters will be in effect. Use built-in drive/folder icons in Folders panel – show icons built-in into FastRawViewer in the Folders panel (in several cases, using the system’s icon can lead to problems). Use system Open file/Open folder dialogs – switches between standard and smaller dialogs when opening files/folders. Use built-in file/folder icons in Open File/Open Folder dialogs – when using non-system dialogs for opening files/folders – use built-in icons. Force open Folders panel if started without filename – if this setting is on, starting the program without a file to be opened, or with an invalid / non-existent filename will result in the display of Folders panel, even if this panel was switched off previously. 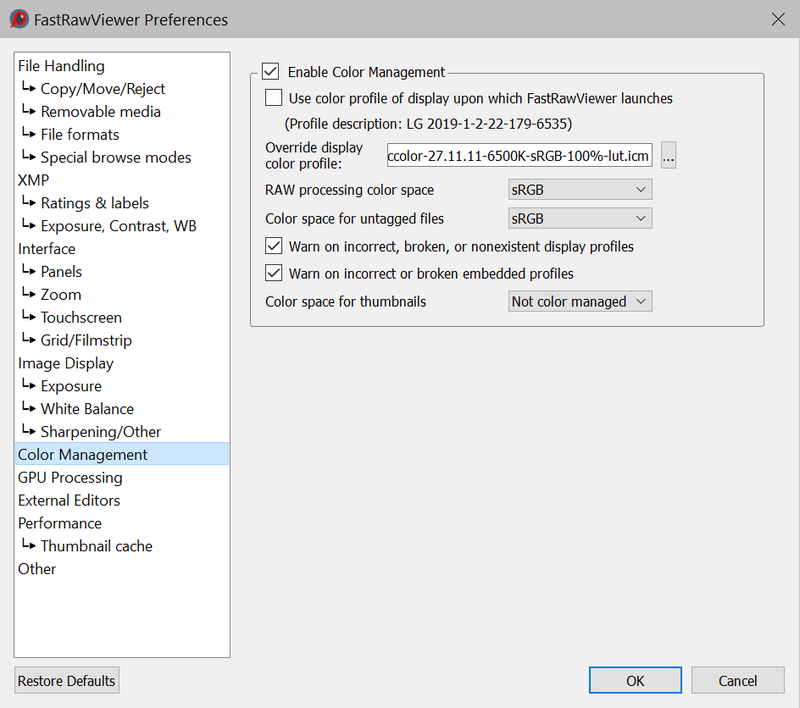 Disable splash screen – switches off the display of logo at FastRawViewer start. Edit bottom bar items – launches the dialog that allows one edit the composition of the program’s bottom bar. Panel’s font size: sets the font size in the informational panels. Panels color scheme – sets the brightness of the panel background. Hide Menu bar when hiding information panels – for the hide informational panels mode (Tab), controls if the menu bar should be hidden too. Hide bottom window bar when hiding information panels – hide main program window status bar in ‘hide information panels’ (Tab key) mode. Disable transparency for panels outside of main window – allows disabling transparency for informational panels that are placed completely outside the main program window. Dim Histogram/Stats/Exif panels while changing files – enables dimming of those panels for the time needed to switch to the next file. Dimming takes additional 6 to 15 milliseconds, if maximum performance is needed, you can turn this off. Restore Panels -> Hide all state on program start – allows the program to recall the “all panels are hidden” state when it’s opened. Keep zoom ratio – will keep the zoom factor. Fit to window – the Fit to screen mode will be turned on. Fit to width – the image takes up the entire width of the window. Zoom and Drag Zoom to – sets zoom factor to use in the Zoom and Drag mode (Shift – left mouse click). Zoom and Pan Zoom to – sets zoom factor to use in the Zoom and Pan mode (Shift – right mouse click). Toggle Zoom Zoom to – sets the magnification/zoom level used for the Toggle Zoom (Z) mode. Large – fixed zoom step value of about 50%, to be used for keyboard control. Medium – zoom step is set to 20%. Small – zoom step is set to 5%. The last two settings are designed to be used while zooming with the Mouse Wheel or trackpad. Zoom In/Zoom Out range sets the range for zoom values for Zoom In/Out actions for any zoom mode, be it through menu, keyboard shortcuts, or mouse wheel. 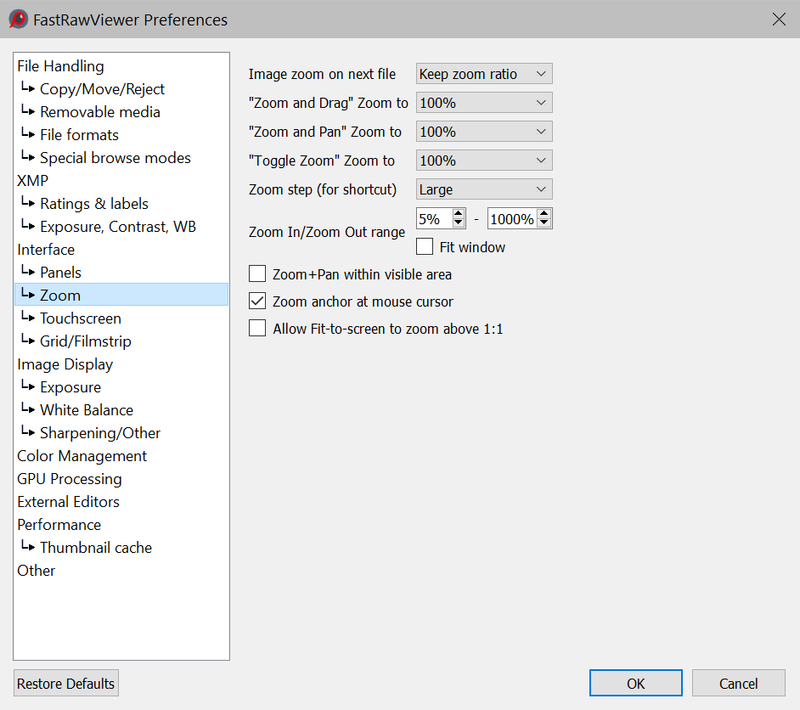 Fit to Window – sets the minimum zoom level such that the image fits in the window. Zoom+Pan within visible area – if this setting is on, then the panning will take place inside the area visible before the start of the panning. If it is off, then the panning will be over the entire image. Allow Fit-to-screen to zoom above 1:1 – this allows one to zoom (small) images to more than 100% in the Fit To Screen/Fit to Width modes. Zoom anchor at mouse cursor – zooming will happen taking the position of the mouse cursor into account; the point underneath it will retain its position respective of the window during zooming. If turned on (default, "legacy" behavior), then the pixel in the screen is considered to be the "logical pixel" (in the case of Retina, it's a block of 2x2 "physical" pixels) and the calculation of the zoom size is done in these units. If turned off, the zoom value is calculated in "physical pixels", so for Retina screens the displayed zoom value will now be doubled, and at 100% zoom the image will be half the size compared to "legacy" behavior. Enable Toolbars – turns on toolbars (their visibility can be controlled through Menu – Panels – Toolbars). Toolbars size – controls the size of the toolbar icons. The settings in this group control the display of the image in Grid mode and the Filmstrip panel. Enable Grid mode – Turns on/off support for Grid Mode. You must restart the program for the change to take effect. Start in Grid mode – when launched without passing a filename, FastRawViewer will start in Grid mode. Remember Grid/Single file state on exit – turns on restoration of the previous mode for the next time FastRawViewer is launched. Browse folders in Grid mode – when moving from the current folder to another one, FastRawViewer will switch to Grid Mode. Hide panels floating within main window in Grid mode – if the setting is on, all floating panels in the Grid Mode that are currently positioned inside the program’s main window will be hidden; they will reappear when switching to Single File View Mode. If Docked at bottom – if the Filmstrip panel is at the bottom of the program window, it will be hidden upon switching to Grid Mode. The setting has no effect for a Filmstrip that is anywhere else. If Docked anywhere – the Filmstrip panel will be hidden if it is located in one of the main dock areas of the main window (at the top, at the bottom, and on the left). If the Filmstrip panel is dragged out of the main window, it will stay visible after switching to Grid Mode. Partial – only partial decoding is preformed, enough for displaying the exposure statistics and histogram. In this mode, browsing files happens faster. Full – full decoding is preformed, and switching to Single File view mode is nearly instantaneous. Auto – the font size is set automatically, based on the setting for the Panel Font size and the preview size. Extra small…Extra Large – the font size is set to the same as that of the Panels (using the same setting). 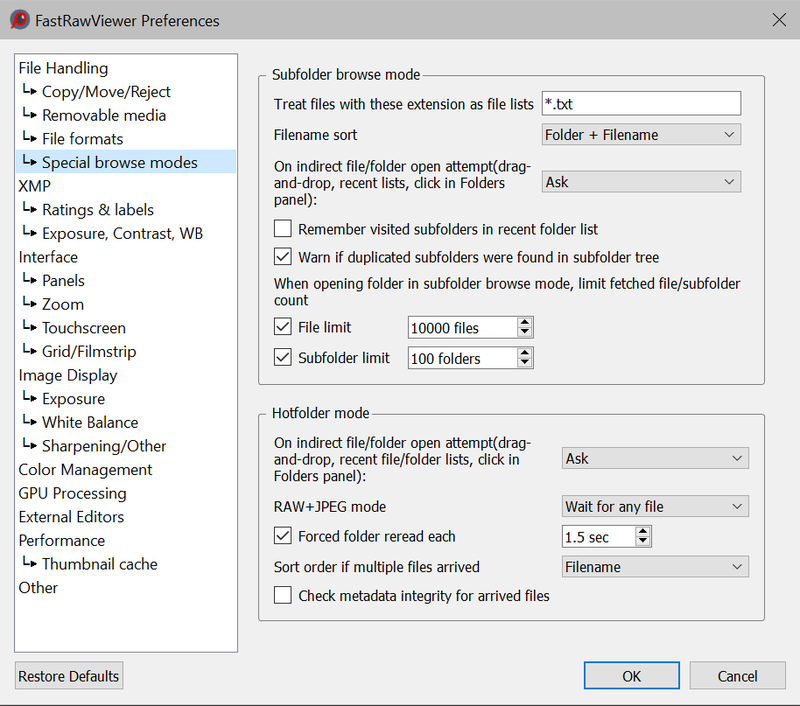 Advanced Selection mode – enables the “advanced” mode of selecting files, for details see Operations with Multiple Files. Both – considers the current file to be a part of the group and works with all of it. Apply automatic brightening to thumbnails – automatically increases the brightness of previews in Grid/Filmstrip modes if they’re too dark. Ignore folder paths on selection load – selection lists are simple list of files with full path, one file per line. With default settings, full path is checked against current visible files list, so selection lists are bound to specific folder. With Ignore folder paths… option on, only filename part is checked against current visible files list, so selection lists become folder-independent. No centering – never center. Edge items only – if the edge-most item is selected, it’ll be moved to the center. Always center – the active item will always be in the center. The settings in this group control the processing and the display of the images (Exposure, White Balance and Screen sharpening are tuned in separate preferences pages). Gamma 1.8, Gamma 2.2, sRGB, L* - sets one of the standard tone curves, typically used in image editing. Variable contrast – corresponds to the variable tone/contrast curve, see Adjusting image contrast section for details. Boost shadows amount – controls the additional gamma adjustment while in Boost Shadows mode, the range is 0.2 to 2.0. Gamma decrease – the amount by which the Gamma for the image will be reduced. Decrease Exposure by – additional image darkening. Apply UniWB white balance – White Balance will be substituted with UniWB, thus avoiding any possible clipping caused by White Balance. Exposure correction: No correction or ETTR (ETTR settings are selected on the Exposure tab. Use embedded color data for – controls the use of color data embedded into RAW files and allows using that data instead of data that comes with FastRawViewer. Detect – monochrome images are detected automatically, and if such an image is detected it will be processed as a monochrome (this mode is slower, because such an image will be processed twice, first as a color image; and after that, if it is detected that in fact it is a monochrome image, it will be re-processed). Apply Adobe hidden exposure correction – switches ON the automatic exposure correction similar to the one used by Adobe RAW converters, such as Camera Raw and Lightroom. With this correction ON, same values in exposure correction will result in overall image brightness being similar between Adobe converters and FastRawViewer. Set hidden exposure correction to – allows setting a user-defined value for the hidden automatic exposure correction. Often this is not necessary, as FastRawViewer already comes with the corrections for all cameras supported in Adobe converters. No correction – no additional exposure correction (apart from the Adobe-style one, if it is ON) is applied when a file is opened, unless the correction is found in the accompanying XMP sidecar file. Autoexposure – automatic exposure correction is applied, according to the settings listed below. Keep from prev. file – the new file will be opened with the same exposure correction that was set for the previous file (it does not matter here how that exposure correction was set, manually or automatically). Auto Exposure – controls the automatic exposure correction (the one that is applied when ‘automatic correction’ action is performed). Fixed Exposure Shift – the exposure is shifted by the fixed value. ETTR-style autoexposure (shift histogram to the right) – positive exposure correction that forces the saturation of the given percentage of pixels (those saturated pixels are having value of 255 on the 8-bit scale); the percentage is controlled through Saturate up to %NN of pixels setting. Hard limit – the limit is set to the given amount. Virtual ISO – limits the automatic exposure correction, taking into account the ISO setting in the camera. For example, if the current shot is taken at ISO 400 setting in the camera, while auto limit is set to ISO 6400 (the default value), the positive exposure correction is limited to (6400/400 =) 16 times, or, in photographic units, to 4EV. Manual exposure step size (small step/big step) – sets the step sizes for manual exposure adjustment change. Exposure adjustments affect OverExposure display – when turning on this setting the change in exposure adjustment (both automatic and manual) will affect the display of overexposed areas. Under/Overexposure layer opacity – controls the perceived contrast of the highlighting for over- and underexposed areas. Use camera linearity limit to detect clipping – displays overexposure for RAW for the RAW values that are larger than the camera’s linearity limit as recorded in RAW file metadata (not all the cameras record it; if the limit is unknown, then the maximum possible value will be used). Underexposure detection limit NN EV below sensor saturation – sets the “usable dynamic range” of the camera with one value, the same for all ISO settings. Everything below this limit will be displayed as underexposed. For ISO above 1600 – the dynamic range decreases by one photographic stop for each stop of ISO increase, but no less than the value set for @high ISO. Same as previous – keep the current white balance choice. Camera Auto/As Shot – if the camera records the metered white balance (which may differ from that which is used during the shoot), then that balance is used. Otherwise, it will be As Shot. All others – the respective white balance mode will be in effect. a file coming from a different camera model. Mired/Tint – instead of correlated color temperatures, the value indicated is in Mired. Useful for selecting color filters to be used on the lens and on studio lights. WB Coefficients – the per-channel multipliers for white balance are indicated. Channel EV Correction – per-channel correction in EV (stops) for white balance are indicated. 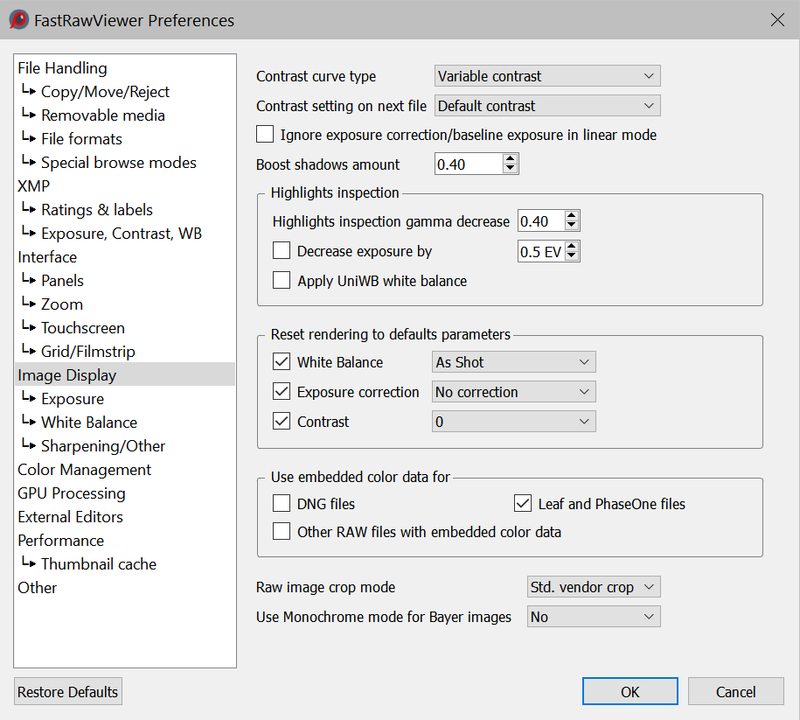 Read White Balance presets from RAW (if present) – turns on reading white balance tables from RAW files. On-screen sharpening – enables sharpening for display. Button/Shortcut – turns on when the button is press. Preset 2/Enabled – allows one to use a second group of parameters for sharpening, thus cycling will be between Off-Preset1-Preset2 or Off-Preset1. Radius – the radius the Unsharp Mask filter, which closely correlates to the Radius parameter in Adobe Photoshop USM settings. Amount – the strength of the sharpening, same as Amount Photoshop USM amount. Sharpen RAW files only – if this setting is on, the sharpening for display will affect RAW files only. When setting custom grids, the first parameter sets the amount of steps along the long side of the image. Enable Color Management – turns on ICC-compatible color management. Use system profile (for monitor where program starts) – the ICC profile chosen in the system for that monitor where the program is being started will be used as the profile for the monitor. Display Color profile – allows one to specify a file with the ICC profile for the monitor. RAW processing color space – allows one to set a color space in which the last steps of the RAW data processing are done (the first steps are performed in the camera’s color space). Lab TIFF files will be converted to the same color space when displayed in Single File View Mode. Color space for untagged JPEGs – allows one to set a color space for JPEG files for which the color space is not specified (not recorded in EXIF tags or ICCProfile of JPEG sections). Warn on incorrect, broken or nonexistent display profiles – turns on a warning for when one tries to use an incorrect display profile. Warn on incorrect or broken embedded profiles – turns on a warning for incorrect profiles built into the JPEG data. Color space for thumbnails: sets the mode for color space for previews (thumbnails). Lab TIFF files will be converted to the same color space when building previews. Previews for these files will be stored in the preview database (if it is in use) in RGB format. Because of this, when you change the color space for thumbnails, we recommend purging the preview database if it contains previews for Lab TIFF files. This group controls the video card modes and how the sharp areas of the image will be displayed. 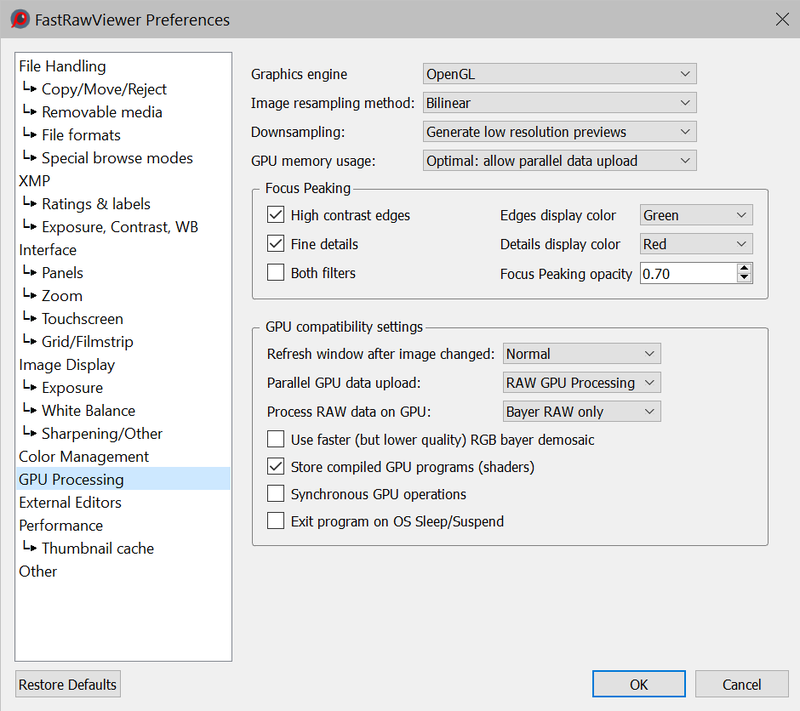 Graphics Engine (Windows only): sets the method of using the graphics hardware acceleration: DirectX 9, DirectX 11 (Windows7 and newer), OpenGL, OpenGL emulator. The last option can only be set through an external script, as it results in extremely low performance, and can be selected only for the purposes of testing. No resampling – for large zoom factors, the image will look as if it is constituted of small square tiles. The fastest method. Bicubic resampling – high-quality method, could be slow; a relatively fast vast video card is recommended. None – no additional processing, the downsized image may have a low quality look. 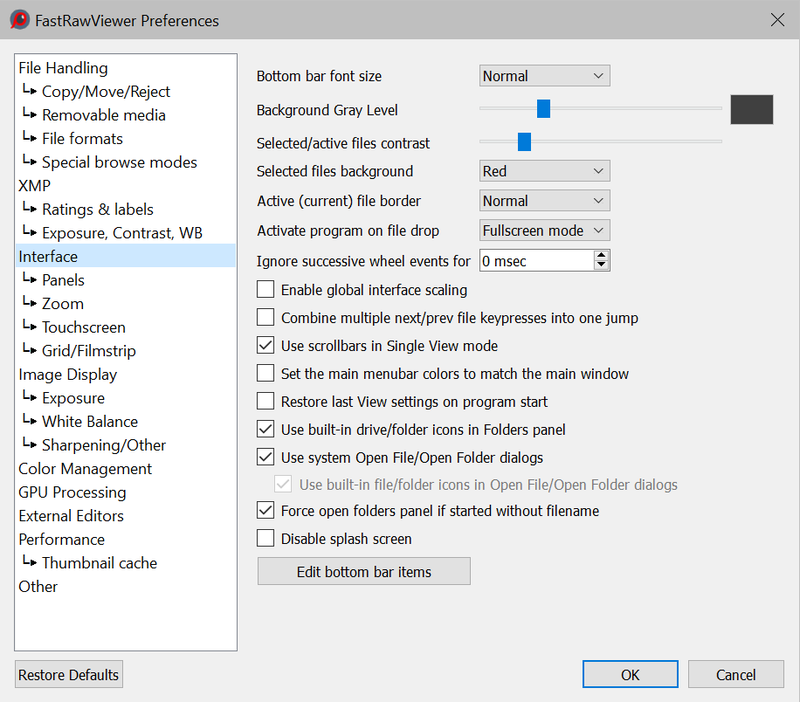 Generate low resolution previews – low-resolution previews are rendered in advance with the help of video card driver. Requires additional memory for the graphic textures, compatible with all video cards. Suppress downsampling artifacts – suppresses the colored noise on the high ISO images. Not supported on all video cards. Minimal – all unused graphic resources are immediately freed up, and allocated again if necessary. This is the slowest mode. Minimal+ – uses one set of graphic resources, when moving to a smaller image, video memory is not freed up. Optimal – two sets of graphics resources are used: the currently displayed image and the "next" one; when refreshing the window, the whole image is redrawn at once, and not piece by piece. Maximal – up to four sets of resources are used (RAW, embedded JPEG, external JPEG, and the currently refreshed), the second switch between RAW and JPEG is instantaneous. High contrast edges – enables the outlines for contrasty details using color contouring. Edges display color sets the color for the contours. Fine details – enables the outlines for the areas with plenty of smaller sharp details using color contouring. Details display color sets the color for the contours. Focus Peaking layer opacity – controls the fading of the main image for the Focus Peaking contours to be visible better. Parallel GPU data upload – enables parallel data loading to GPU, available only for OpenGL video mode. This can improve performance, depending on the GPU and the drivers. Always – use for all files. 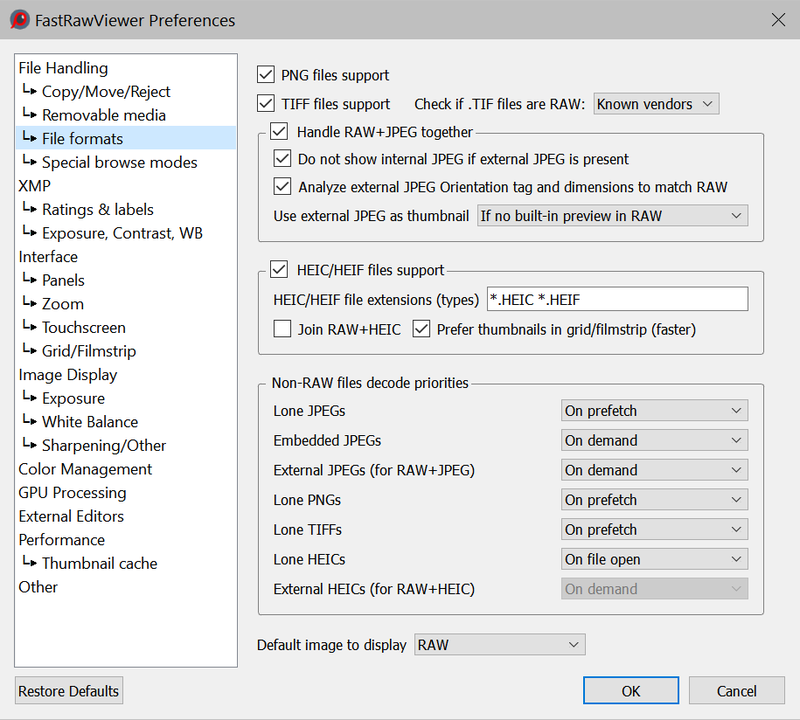 All RAW files – use GPU for processing of all RAW files. Use faster (but lower quality RGB bayer demosaic) – use lower quality demosaicking, same quality as of the one used when processing RAW data on CPU. Store compile GPU programs (shaders) – on those video cards on which this is supported, compiled GPU programs will be saved on the disk during the first startup. Program will start faster ever after. Synchronous GPU operations turns on the synchronous mode of video card work (slower, but more reliable). Exit program on OS Sleep/suspend – forces the program to exit when the computer goes to sleep (that is to address the issue with some older OS being unable to correctly restart OpenGL operations after the wake up). This window displays the paths to external programs. FastRawViewer can launch those, passing to them the name of the currently displayed file. Supports batch processing: if this checkbox is marked for the program, then this program will be included in both Menu – Select/Batch – Batch Run program and in the context menu for groups of files. Use […] buttons to lookup executable file on your system. Supports batch processing – this program supports the import of several files into it at the same time. Said programs will be displayed in the menu Run Program for file groups. Add slot button adds additional slot for external program (up to 10). If, during the scan, some newer versions of applications are found, they will be displayed in Replacement Applications column, together with an option to renew (Upgrade) the settings for External Editors tab. Check external programs presence on startup enables check each program existence on FastRawViewer start. If are «replacement» application was found, this replacement will be displayed in the Replacement Application column; thus allowing to renew the settings without resorting to manual editing. Decoded RAW cache size – the number of decoded RAW files that are kept in the operational memory (RAM) to boost the speed of the browsing. JPEG/PNG/TIFF cache size – the number of JPEG files that are kept in the operational memory to boost the speed of the browsing. Number of simultaneous RAW decode threads – the number of concurrent processes of RAW decoding. All changes made to this group of settings come into effect only after restarting FastRawViewer. Downscale JPEGs larger than NN Mpix – JPEG files larger than the specified size will be down-sampled during the decoding process, so less memory will be required, while decoding and display will happen faster. TIFF files size limit, PNG files size limit – TIFF/PNG files above the set limit will be ignored. PNG/TIFF thumbnail generation limit – for files above the set limit, previews will not be created or displayed. Generate high-quality previews – sets the preview quality. High-quality previews (the checkmark is set) are built noticeably slower. Use high speed preview for Fujifilm X-Trans – this preference turns on faster (but lower quality) processing for files created by Fujifilm X-Trans sensors. This mode is recommended if you are not satisfied with the display rate of these files in standard mode. Intel i3-i7 1st generation with fewer than 4 cores. Use all subframes for Pentax 4-shot files – enables merging all sub-frames into one when working with Pentax frames shot in Pixel Shift mode. 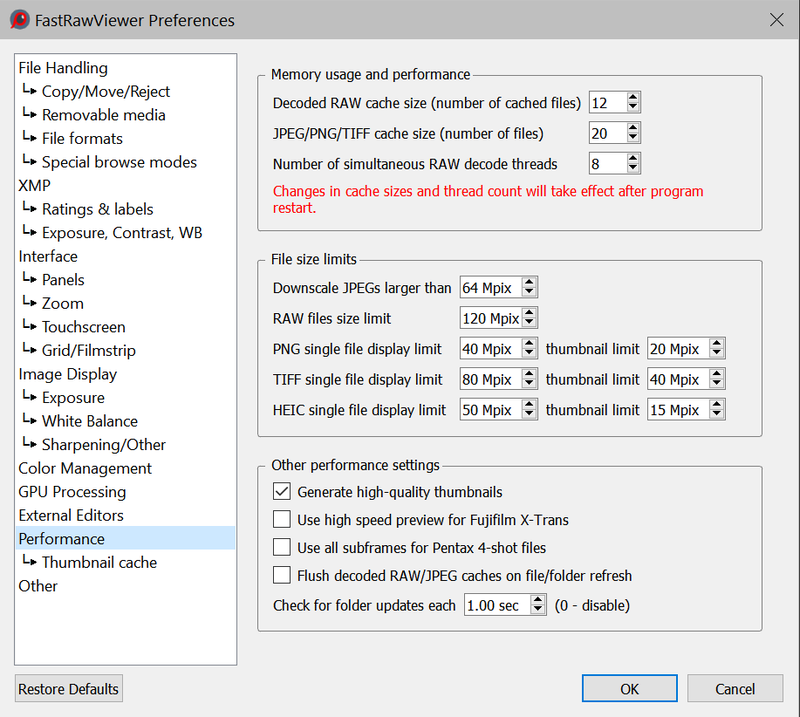 Flush decoded RAW/JPEG cache on folder refresh – if this setting is turned on, then when using Menu – File – Reload – Reload current folder, the decoded file cache will be reset. Check for folder updates each – sets the refresh rate for the list of files in the current folder (if the folder changes, for instance other files are copied into it, then it won’t be reread very often). Prefetch thumbnails for preceding images: to decode previews for the files “before” those visible on the screen. No – concurrency; Thumbnail decoding is not postponed while RAW decoding takes place. Single file mode – Thumbnail decoding is postponed in Single File View Mode until the RAW decoding is finished. Single file and grid modes – Thumbnail recording is postponed for any RAW decoding action. Thumbnail prefetch depth: how many files (relative to those viewed on the screen) to read ahead and decode previews. Thumbnail decoder thread count: how many parallel decode streams (threads) are enabled. 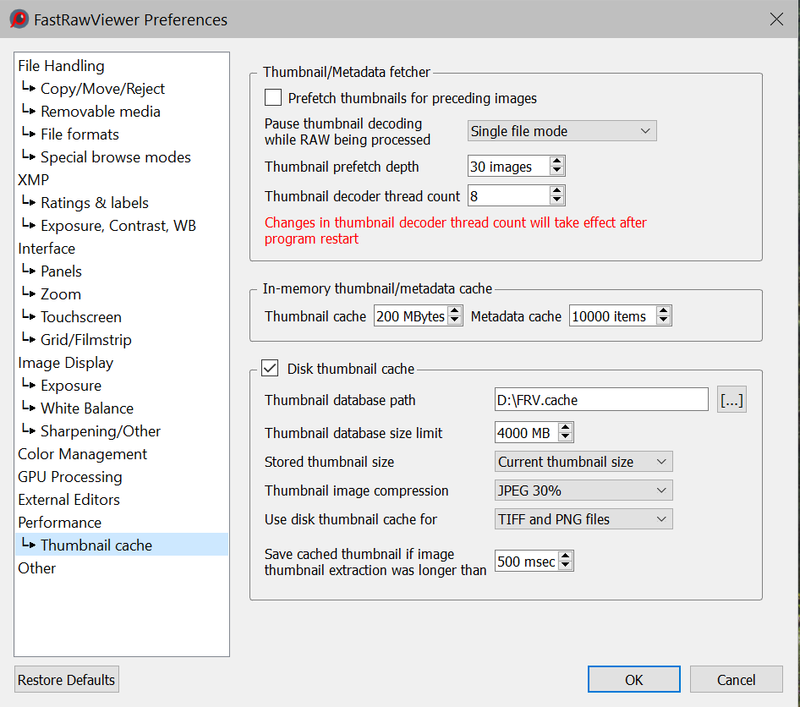 Thumbnail cache size: maximum size of the cached pr­eviews in the memory (each preview is stored in 4-byte per pixel format, so standard 200x133 preview is about 100kb, so 200Mbytes cache limit translates to ~2000 images). Maximum thumbnail size: the largest size available in FastRawViewer, 1600x1600 physical pixels for retina monitors, 800x800 for other monitors. · Thumbnail image compression: compression type (uncompressed, JPEG-90%, JPEG-30%). Save cached thumbnail if image thumbnail extraction was longer than – this is the main parameter that selects for which files previews will be stored in the database. Only those files, the building of previews for which will take greater than or equal to the amount of time set in this parameter will be stored in the database. Consequently, the only things that will go into the database are the previews that were built relatively slowly, and the database itself will grow slower. If you want to store previews for all files here, set the parameter to 0ms. 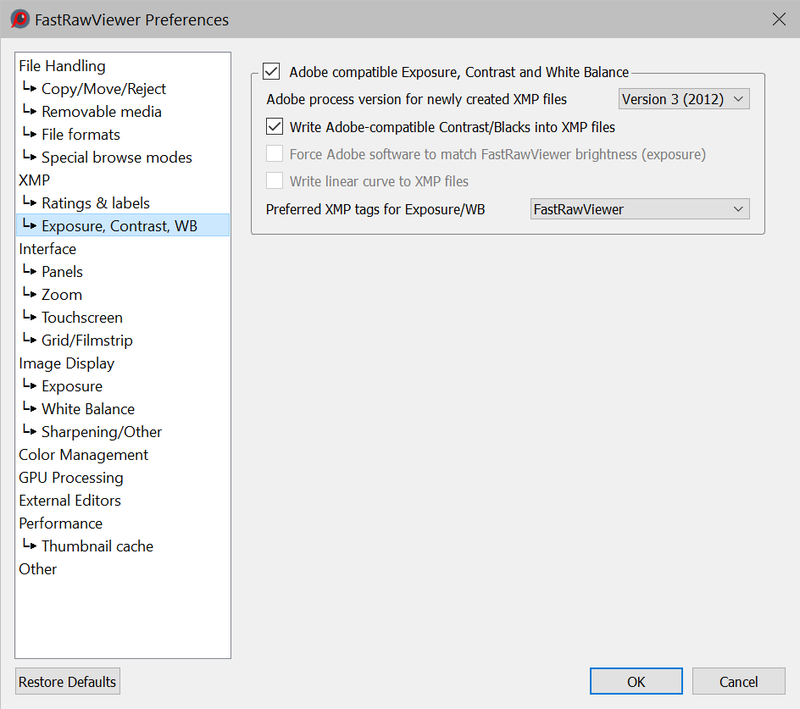 Force RPPS files creation – saves an .rpps file with automatic settings for WB/Exposure when a RAW file is opened. Never write Green2 white balance for RGB files – switches off the recording of the separate white balance coefficient for the second green channel. RPPS Template – the name of the file that will be used as a template while creating specific .rpps files (used if .rpps file does not yet exist for the raw file). Check for updates – this parameter schedules the checks for updates - at each program launch or once in every 1-3-7-15-30 days. Debug log messages – turns on the debug mode, the debug messages are available through Menu – Help – Debug log. If the setting is set to some on state, Show Debug log in Explorer/Reveal in Finder appears as last item of Help menu. No – do not record log into file. If you’ll change to No from some Yes… settings, existing log file will be removed. Yes, keep forever – log file recorded and not deleted, so it may grow indefinitely. Run single program instance – (Windows only) turns on the “one instance” mode of the program. At an attempt of starting the second instance, the file is displayed in the already existing program window. Monitoring of Removable media change (CD/DVD, USB devices). Monitoring changes in the folder tree structure. Faster program close – (Windows only) turns on the fast program completion mode. A few of FastRawViewer’s settings are accessible only by running scripts that are installed alongside the program. These “hidden” settings are needed extremely rarely, and should be applied, as a rule, only once. These settings are only read at program start, so if you apply scripts with FastRawViewer running, immediately close the program and restart it. If the program is not closed immediately, and you move to editing and saving the settings, the changes made by the script may be lost and require repeating the procedure. Select the necessary script and launch it (double click or press Enter). 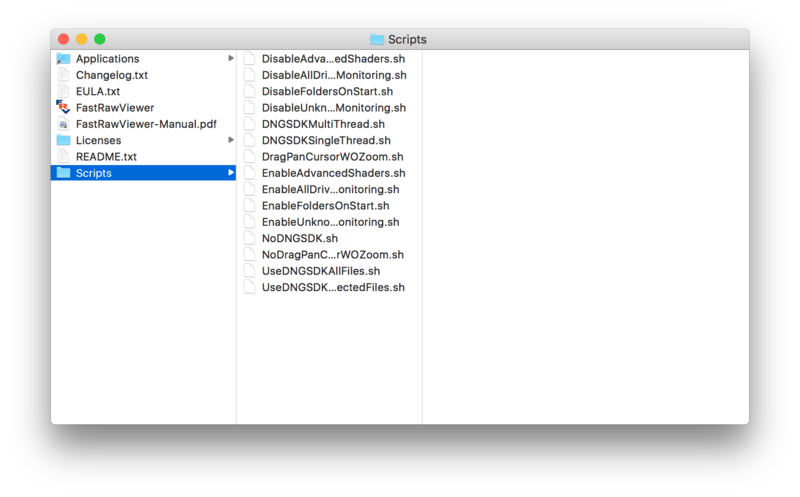 The OS X version of FastRawViewer contains the scripts in the application’s resource folder. 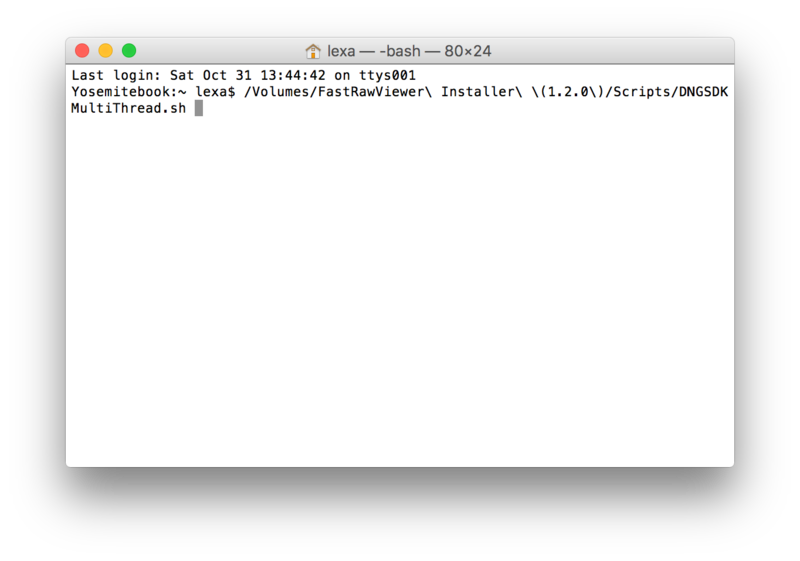 Applications – Utilities – Terminal. Drag the needed script onto the Terminal window, and you will see the full path to the script you are about to execute. Switch to the Terminal window and press Enter. The script will be executed without any output to the Terminal window; if there’s some sort of message, it means that there was an error. These scripts are for both Mac and Windows, however for all modern Macs, it is not necessary to turn off resource-intensive operations – the efficiency of the graphics adapters is good enough to use those. Switching them off may be necessary for Windows platforms using low-end graphics (chipset Intel graphics, the oldest and weakest graphics processing cores). When starting FastRawViewer passing the file name as an argument (including through the Start without filename setting) the last state of the Folders panel (opened/closed, floating/docked) is applied. When starting without a filename as a parameter, the Folders panel always opens. Disable: FastRawViewer starts with a closed Folders panel. It can be opened through Menu – Panels – Folders. This setting is intended, first of all, as a test in extraordinary situations – in a few rare cases, the monitoring of the removable media status and/or the use of the folder/disk system icons leads to FastRawViewer not being able to work. Enables/disables automatic folder tree refresh in Folders panel. Use if you have problems with automatic folders refresh (program crashes after copy/move to newly created destination). Allows one to switch the Interface – Use built-In file/folder icons setting without launching FastRawViewer. This is intended for the case when the additional icon provider that is built into the system isn’t working (this has been known to happen, for example, with some versions of Dell Backup) and FastRawViewer cannot be launched to change these settings because the program crashes during the communication with the icon provider. Windows-only: sets font size on the bottom line in pixels, not in points. This is intended for cases when two displays with very different resolutions are being used. …VolumeLabel – show volume label (same as Share name for most NAS, may differ on Windows servers). Use/do not use DNG SDK in multi-thread mode. Multi-thread mode gives greater efficiency, but may take up over the processor, getting in the way of other computer programs running at the same time. Enables (default)/disables RAW data decoding. If disabled, FastRawViewer will show embedded/external JPEGs only. If disabled, it can be turned on temporarily by -enableraw command-line switch. The list of additional extensions (apart from .tif and .tiff) that will be interpreted as an indicator of TIFF files. Windows: Copy the file C:\Program Files\LibRaw\FastRawViewer\scripts\AdditionalTIFFextenstionSample.reg somewhere, edit it as you like: the list of extensions can be set as *.EXT1 *.EXT2, or .EXT1 .EXT2, or even just EXT1 EXT2, the space is the separator. 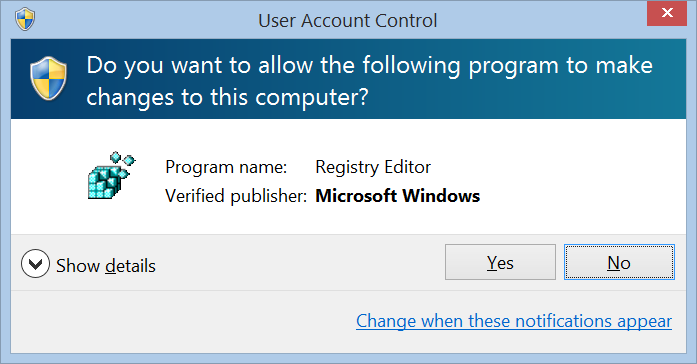 After that, double-click on the file; RegistryEditor will launch and import your setting. Mac: execute the following command in the Terminal: defaults write com.libraw-llc.FastRawViewer Prefs.AdditionalTIFFExts "*.fff *.yyy" Here *.fff and . *yyy are those extensions that you would like to be interpreted as TIFFs. Media, which are recognized by FastRawViewer (CDROM, Floppy disks), but for which there are no separate settings in the Preferences (it is there only for Removable Media and for network volumes). Turns on (default)/off the centering of the highlighted Filmstrip element when changing the contents of the current folder. Intended for more flexible processing of a situation where an external program creates files and you want those files to be either visible or invisible to FastRawViewer. This is default and legacy behavior. 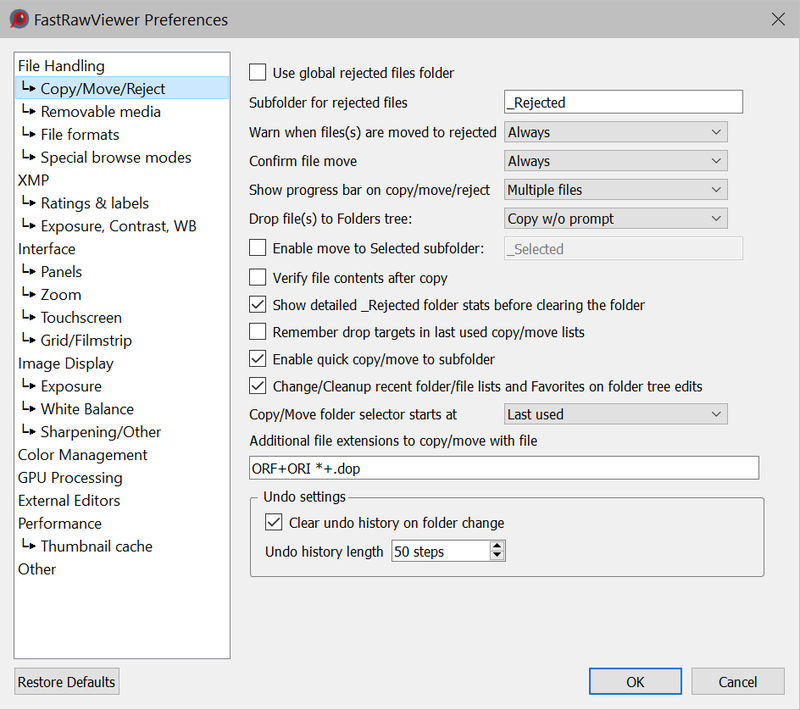 1 (set by the RefreshFolderAfterProgramRunSoft script) – there is no suspension of the current folder refresh; if the launched external program created a file, FastRawViewer will detect it without any extra delay (without Forced folder refresh). If this file is being generated slowly, FastRawViewer will attempt to track the process, based on the changes in the file size and to delay opening this file while it is still growing, but this is hard to guarantee. 2 (set by the RefreshFolderAfterProgramRunForced script) – using the time set in Check for folder updates each ... , FastRawViewer will force a re-read of the current folder. 3 (no prepared script) – the combination of methods 1 and 2. Sets the default mouse wheel scroll step for all scrolling lists (folders, thumbnails in Filmstrip and Grid View, EXIF table). If one wants to increase/decrease the contrast – copy the script, and edit it (change the default value to wheel step needed) and run it. File selected by Filmstrip panel navigation is not opened immediately. This delay allows arrow keys Filmstrip navigation without CPU/disk overload (not every intermediate file will be opened). Default delay is 30 milliseconds. If one wants to increase/decrease this delay – copy the script and edit it. NoFileArrivalDelay - sets the delay to zero, thus disabling any extra delay and file size change analysis. This script assigns a standard value (0) to the ShiftClickSelectionMode parameter, which modifies the program’s behavior while selecting a range of files using Shift-Click. To change parameter value you need to edit the script before apply. 0 - the second limit for the Shift-Click's range will be 'last Ctrl-Clicked', irrespective of whether the action was "selection" or "de-selection"
1 - the second limit for the range will be 'last Ctrl-Clicked' only if the action was "selection"
0 - Shift-Click always creates a new range selection, overriding the previous one. 4 - Shift-Click always expands the selection, never de-selecting previous selections. Attempts to decode files with a JPEG extension the same as for RAW files. This setting is useful for cameras with modified Firmware (the DiagRAW hack and old versions of the CHDK hack) because these cameras save RAW files with JPG extensions. Check GPS Status field (default) or ignore it and display GPS coordinates regardless of status. OEDetectionMethod allows one to change the algorithm for detecting overexposure. Default - invokes the default method, which searches for the rightmost hump on the histogram. Manual - a manual setting, the value is taken from the OEManualLimit parameter. CoolscanNEFGamma sets the Gamma value for processing Nikon Coolscan NEF files. The value is multiplied by 100, that is for Gamma 2.2 use 220; for Gamma 1.0 use 100. The default value is 220. There are no scripts to edit this, please set this value into the registry manually. Turns on the option of rotating in Single View mode while recording this to XMP is disabled. The orientation isn’t recorded anywhere. Alternate keyboard handler (Windows only) – turns on the alternative keyboard shortcuts processing mode. Turn on only if there are problems with the processing of keyboard shortcuts (this happens when using utterly non-standard keyboard layouts, for instance when switching between Qwerty и Dvorak). By default, FastRawViewer uses all of the available processing cores to process RAW data. Setting the Prefs.ProcessingMaxParallel parameter to a smaller value (taking HyperThreading into account) may increase the performance if there are many cores while the RAW files are relatively small. Turns on/off the use of AVX2 instructions where for those computers where this instruction set is supported. By default, this is turned on. Turns on memory mapped file access instead of file-read based one. May be slightly faster in some cases (e.g. ultra-fast local PCIe disk drive). Turns on (default)/off the display of the Drag and Pan cursors in the case when the image fits completely in the Window and there is nowhere to Drag/Pan. Enable (default mode): if a user issues a new command to move to the Next/Previous file while FastRawViewer was still executing the prior Next/Prev File command, this new command is queued and will be executed as soon as the prior one is completed. This allows for fluid browsing through files with just the Spacebar depressed, but can become uncomfortable if very large files are present, as reading and processing such files takes time. Disable: the new command to move to Next/Previous file will be ignored while the current command is in effect, and transition to the current file is not completed. Turns on alternate XMP write mechanics, use only if you experience problems with standard method. Turns on bottom bar font size setting via pixels (DPI-independend), not points (DPI depended). Use if you have multiple monitors with very different resolution and OS is unable to deliver resolution data to FastRawViewer application. Enables (second) forced main window size restore after main program window made visible. FastRawViewer can be used for the display and analysis of images from “engineering” cameras, which are saved in the form of “sensor data dumps” without any other additional metadata. A series of such cameras are already directly supported by the program (FastRawViewer contains an internal table with the necessary data); to support other (arbitrary) sensors, one has to add a description of the structure of the sensor’s data into the Windows Registry (on Windows) or OS X defaults (on Mac OS X). And run it in Windows Explorer. Camera01 (or Camera02 … Camera64) – the “number line” in the table, up to 64 records of this type are supported. The exact size of the file in bytes (in this example – 24096096). This is the only criterion by which FastRawViewer recognizes a data “format”, files of a different size will be ignored. The width of the sensor in pixels. Put the entire width, including the “black frame” in this field. The height of the sensor in pixels, including the black frame. The width (height) of the black frame at the top. The width of the black frame at the right edge. The width (height) of the black frame at the bottom. Additional parameters for the file decoding subprogram (see below). Bit 0 – find a .JPG file with the same name and read the EXIF data from it. The offset of the beginning of the sensor data from the beginning of the file (the value range is 0-65534, the special value 65535 means that “the rows are going in the opposite direction”). 8, 10, 12, and 16-bit data formats are supported, the number of bits is calculated as (the size of the file minus the offset from the beginning of the data)/number of pixels. Windows: to back up the settings, please use the BackupSettings.cmd script, which is installed in the same C:\Program Files\LibRaw\FastRawViewer\scripts\ folder as the scripts described above. LastUsedSettings.reg – this contains the automatically saved settings such as a list of Recent Files/Recent Folders, window position, etc. Double-click the file with the backup copy of the settings you want to restore – this will import them into the Windows Registry. All of the standard backup procedures for Macintosh (TimeMachine, etc.) will save and restore those settings without any trouble.